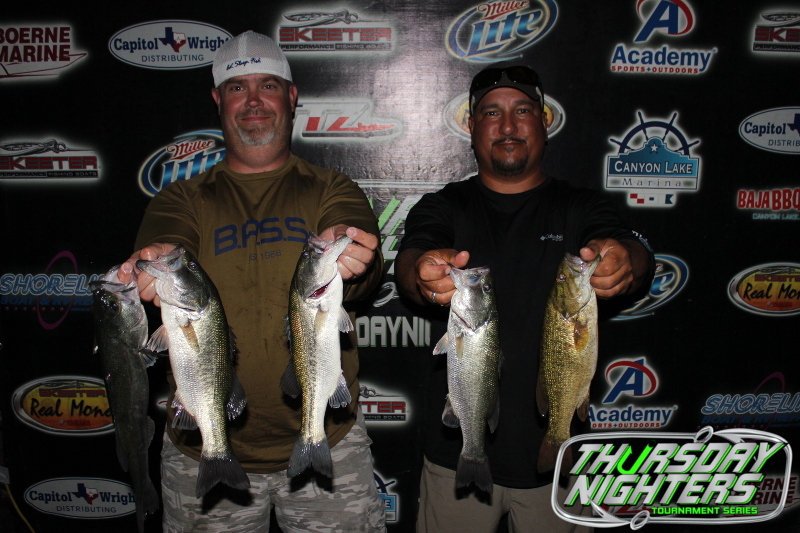 CANYON LAKE, TX – It’s getting, no, it is hot out right now and the fishing on Canyon Lake is definitely not. 108 anglers were greeted with heat wave like 102 degree temps at take off last night and didn’t see temps drop below 100 until nearly 8pm. The wind blew a little to help keep things manageable, but it didn’t help the fish catching. 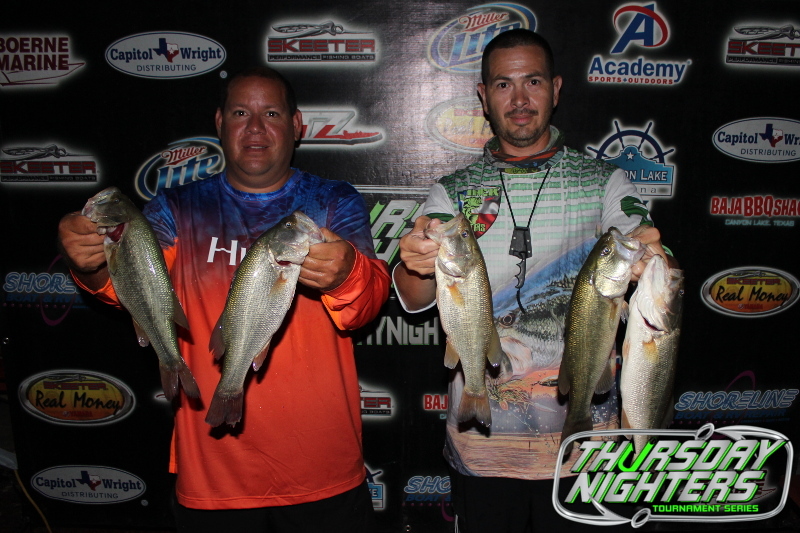 Winning for the third consecutive week were Jason Olivio and Joey Rodriguez with 5 fish that went 7.76 pounds. The team said they stumbled across a school of fish and caught all their keepers in a 5 minute window throwing jerk baits. 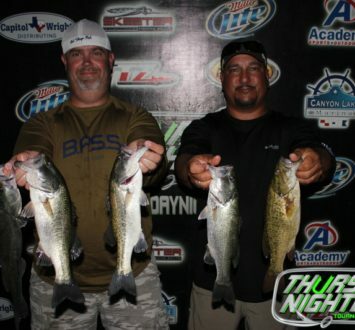 As the lake continues to heat up, so does Jason and Joey as they have caught them a variety of ways the last few weeks. 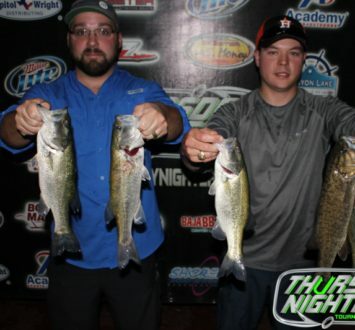 The team took home another $1250 for their 1st place finish. 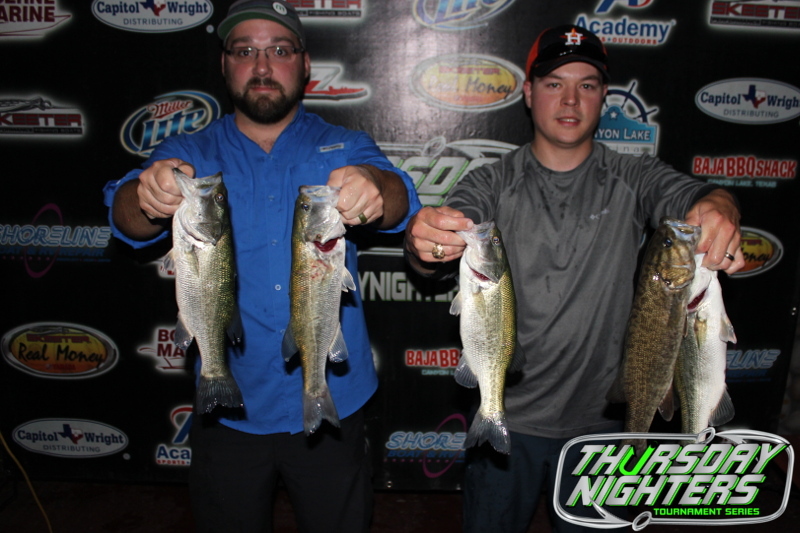 2nd place went to Charles Whited and Trey Groce whom just barely missed out on a win by less than an ounce, weighing in 7.62 pounds. 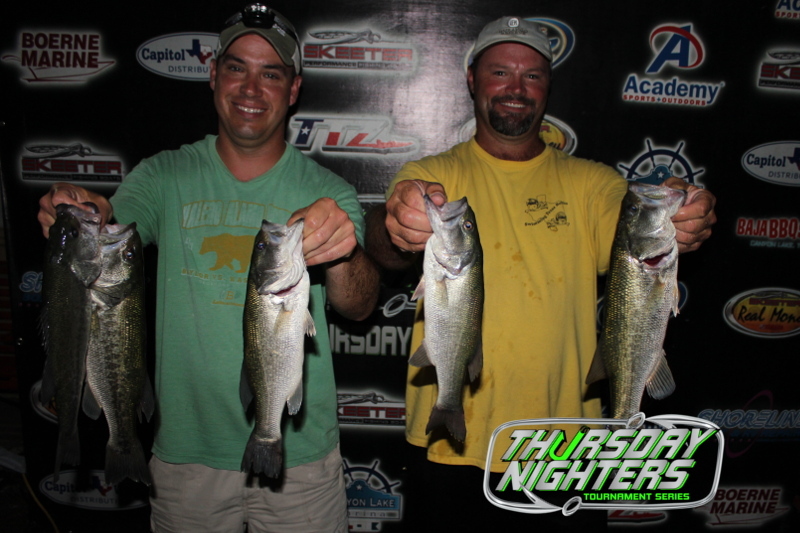 The team fished ledges, just like the rest of the teams in the money below them, throwing soft plastics in the 10-15’ range. 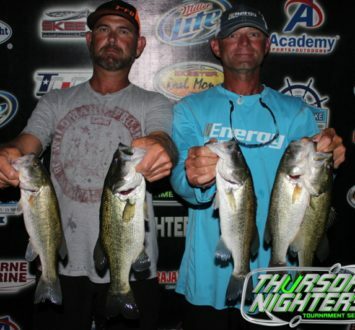 They took home $530 for their 2nd place finish. 3rd place went to Jonathan Haag and Malcolm Kitchen fishing their 6th Thursday Nighter of 2018 and cashing their third check. The team said they just went fishing throwing all kinds of stuff all over the lake and actually were able to cull a couple of times doing it. 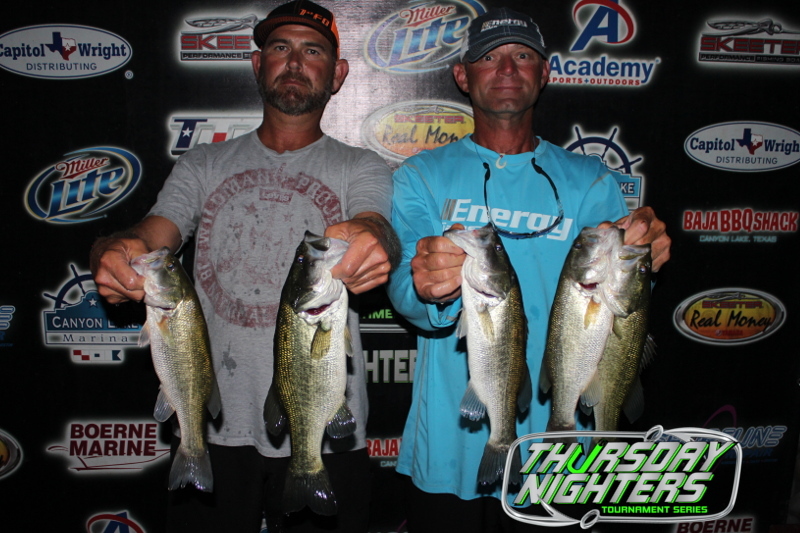 They took home $270 for their third place finish. Zebra muscles have come into play more than ever as of late. The zebra muscles have either really started to reproduce the last month or so, or the low water conditions where many anglers have been fishing shallow have now exposed more zebra muscles. The brush piles are also full of them. 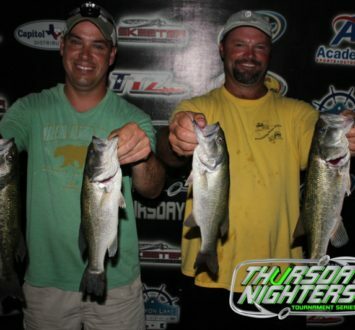 Whatever the case may be, getting fish in the boat has been a feat. Many anglers are relying on drop shots and shakey heads with light line to get bit due to the clearer water which only makes getting fish in the boat more difficult. Next week will be the last Thursday Nighter of 2018. The 2018 championship date and location will be officially announced in the coming days.